Dr. Stephen Patrick works in Vanderbilt's neonatal intensive care unit, which treats many of the drug-dependent babies born in Middle Tennessee. Places with high rates of joblessness also seem to have outsized problems with drug-dependent newborns. That's the central finding in a new Vanderbilt study published in the Journal of the American Medical Association on Tuesday. Researchers looked at 6.2 million births across eight states, including Tennessee. And for those exposed to opioids in the womb, the map matches up very closely to long-term unemployment rates. The lead author, neonatologist Stephen Patrick, says the findings should alter the discussion about how to respond to so-called neonatal abstinence syndrome. He says reducing the rates of opioid exposure among infants is not just about controlling the drug supply. "As we think about how do we build up communities, I think it's part of where we need to be thinking about economic development as a potential way to improve the health of communities," Patrick says. 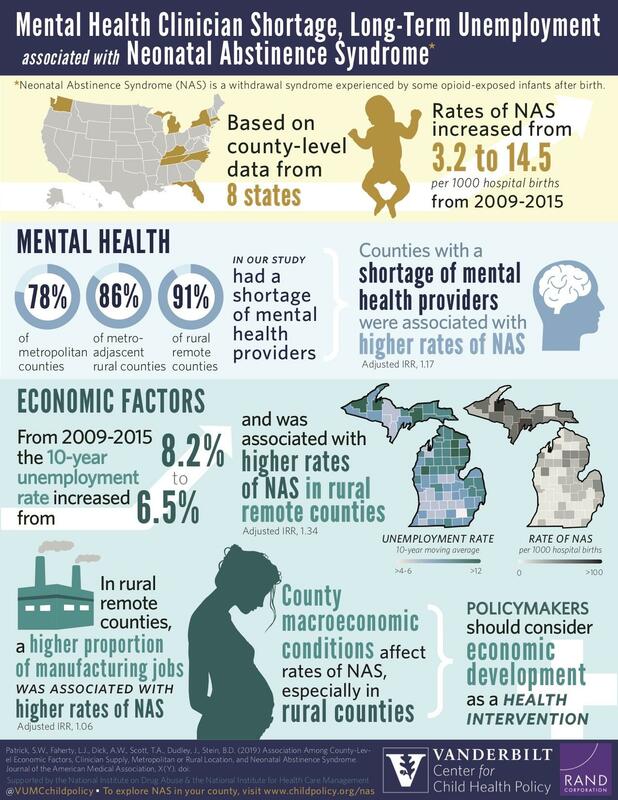 The study (read here) also found that drug-dependent newborns were more common in counties with a shortage of mental health and addiction treatment options. Patrick says he was inspired to direct his research toward these macro issues because the women he works with at Vanderbilt almost always have a far more complicated story than simply stumbling into a drug habit and accidentally getting pregnant. "There are long histories of trauma, lack of opportunity in terms of unemployment, multiple other factors that occur far outside the health care system," he says. "And that's really what made us want to go down this line of work." Researchers in the Vanderbilt Center for Child Health Policy have built an interactive map with rates of drug dependent newborns for each county in the relevant states. Here's a link. This year may prove to be a turning point for Tennessee's crisis of drug-dependent babies. Preliminary figures on the number of cases show they're down roughly 10 percent — the first meaningful drop since the state started keeping track, partially as a result of a budding philosophical change in treatment. The Trump Administration's top doctor overseeing the opioid crisis says Tennessee has led the nation in tracking and responding to drug dependent babies. He's in Nashville along with First Lady Melania Trump for an event on neonatal abstinence syndrome at Vanderbilt.